It provides best practices for leading through a reduction in force. Are you planning a transition event in the near future? OutplacementPro stays with your employees from this ending to their new beginning. 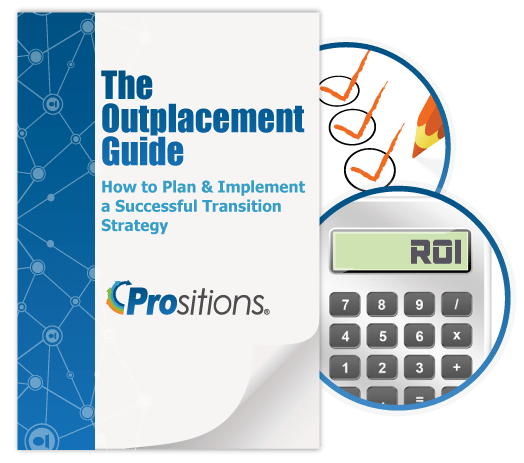 Outplacement goes a long way to mitigate the risks associated with a transition event. Below are just a few of the direct and indirect costs. It is critical to retain remaining employees after a transition event. With turnover costs ranging form 50% – 200% of a worker’s salary, an increase in turnover can have a dramatic impact on an organization’s costs. State unemployment taxes directly affect the cost of an RIF. The longer a transitioning employee is unemployed the greater the increase in tax rate. A transition event can negatively impact a brand. Organizations can lose customer loyalty, experience diminished brand sentiment, and have difficulty attracting new talent in the future. Litigation for wrongful terminations are rising. Organizations are responsible for legal fees whether of not they are found guilty. You’ve been asked to not only manager the process of the transition, but communicate the difficult message to the people directly affected. It’s a tough spot to be in. You know outplacement is the right thing to do, but it doesn’t make the job any easier. Our experts will be with you every step of the way to assist in planning timelines, announcements, and talking points. As a result you will be better equipped to support HR, management, affected employees, and remaining staff with transition details. The key to successful transitions is being prepared and presenting a clear and consistent message to all employees at every step of the process. OutplacementPro will help. You can mitigate many of the risks involved with a transition event by using an experienced partner to help you. Your experience working with our team of experts includes tailored outplacement packages with individual attention to you and your candidates, access to the latest technology, and guaranteed results. OutplacementPro is committed to helping make your transitions event as painless and efficient as possible. Thank you and your company for helping our employees to get back on their feet quickly and helping them feel good about themselves. Everyone I’ve talked with is very encouraged by your efforts and confident that with the help of Prositions, new doors will open for them in the near future. I am very happy that we selected Prositions as our partner! Includes: a capability comparison chart, a Return on Investment (ROI) calculator, and a slide deck template for executive presentations. Copyright © 2016 Prositions, Inc. All rights reserved.